At Green Chair Press, Susan Angebranndt combines her love of type, poetry and old cranky machines to make fine press books, miniatures and ephemera. The fine press work centers on limited-edition “poem books.” This intense focus, together with a design, structure, materials and artwork that speak to the text, aims to give the reader a deeper experience of the poetry. Her books are in collections across the US. Li-Young Lee’s poem Persimmons shows how sight can be deceiving, that perhaps trusting one’s sense of touch can be a better measure of the world. I’ve paired Lee’s words with lines sewn in Braille using french knots, to emphasis this tactile theme. 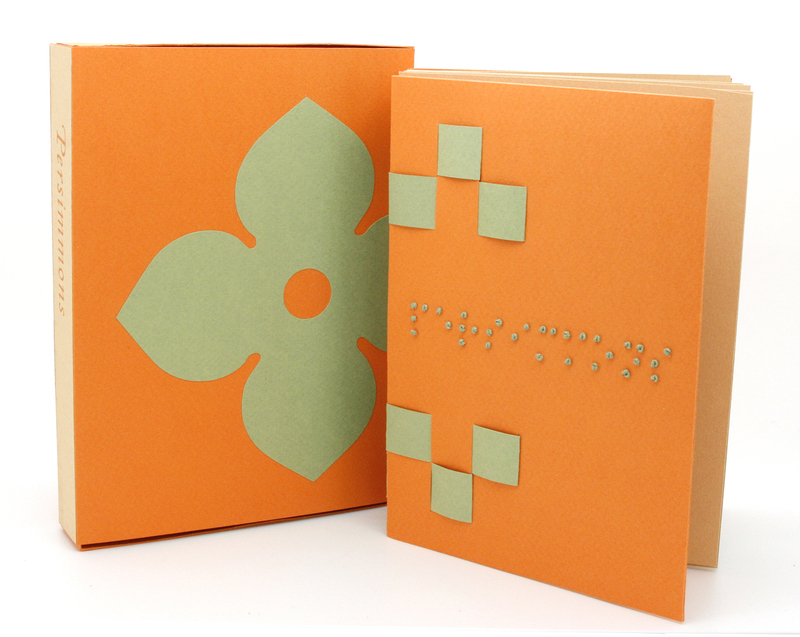 The words in Braille echo the poetry and are also blind stamped above the sewing. The text is printed letterpress on Canson paper. There are 7 spreads, woven together with a technique devised by Elizabeth Steiner. Housed in a paper box. Designed, printed, sewn and bound by Susan Angebranndt. Limited edition of 50 numbered copies.